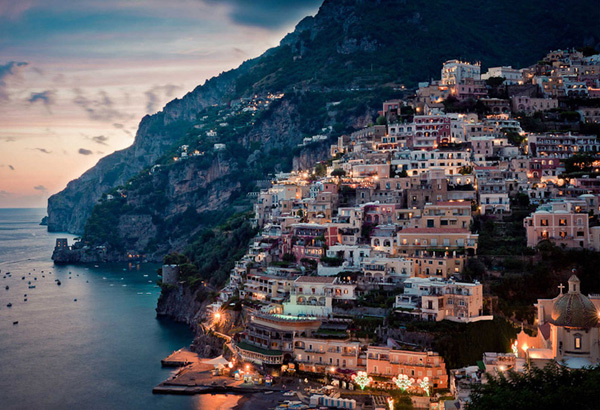 Positano is a small picturesque town with splendid coastal views, on the famous Amalfi Coast in Campania, Italy. The town itself is perched on an enclave on the face of a hill and winds down towards the waters of the Amalfi Coast. Naturally beautiful, Positano attracts thousands of visitors every year. All year long, the town is always full of people, but if you are planning to visit Positano, it would be best to schedule your trip during the spring season. By Bus: take the Sita bus from Sorrento or Salerno (a bit longer, but nice!). From Sorrento sit next to a window on the right hand side for the best views. From Salerno sit on the left side for the best views and excellent photo opportunities. The bus drops you at the top of the town. There are two SITA bus stops in Positano: Chiesa Nuovo (closer to Sorrento), and Sponda (closer to Amalfi/Salerno). You must walk, taxi, or bus to your hotel, so it’s worth working out which stop is closer to your accommodation in advance. During the peak season (starting in late April) this bus can get very crowded. You may have to wait a couple hours and fight your way onto a bus to get back. By Car: Take the main road off of the Autostrada from Sorrento but make sure to have a reservation at a car park as it is very difficult to find parking. By Private Transfer: You can book a private airport transfer from Naples in advance at approx. 90-110€ with a sedan car or 105-145€ with a minivan. By Ferry: Take a ferry from Naples. Slightly more expensive than the bus but you’ll save an hour on the road and get some truly amazing views of the cliffs on the Amalfi coast. For connections between Positano and Amalfi and Positano and Salerno, you need the Coop Sant Andrea or Positano Drive ferry service, the only company which operates this line. By Foot: There are loads of little stairs leading from everywhere to everywhere straight. If you are unfit, or just dont like climbing stairs, its worth booking your accomodation close to where you would like to spend your time to save stairclimbing. Alternatively there is the one road meandering down to the harbour. Buy a Positano town tourist map (4 Euros) as soon as you can, showing all the stairways and lane ways, as well as roads, beaches etc. By Bus: a local bus goes down and – especially – up the hill following the meandering always congested road. On that bus no Unico Campania tickets are valid! The charge to ride the orange bus around Positano is €1.20 if you purchase your ticket from a local shop, or €1.60 if you purchase directly from the bus driver. The shops near the harbor. Ferry trip to Paestum or Ischia and Capri (including the Blue Grotto) during summer months. Or if you are after luxury, charter a private motor-boat with Charter La Dolce Vita and you can design your own itinerary with the captain. Suggested ideas include departing Positano for a full-day tour to Capri, circling island with the grottos or out to Ischia, or along the Sorrento Coast or just cruising along the Amalfi Coast. Soak up the beauty on either of Positano’s two beaches: Fornillo, the smaller, more secluded beach is accessible either by a set of stairs from the grotto above or via a path from Spiaggia Grande. Fornillo has a more laid back atmosphere with four beach bars lining the shore and no ferry traffic. Spiaggia Grande, the main beach and ferry port, is the hub of activity in Positano. Don’t miss it, but don’t forget there is much more to Positano. Water taxi & private excursions. Catch the splendour of one of Italy’s World Heritage from a privileged point of observation and avoid your holiday being spoilt by local traffic.